When I was a kid, my mother’s boyfriend left the house in the middle of the night, dragging enormous boot prints through the snow in the front yard. My sisters and I thought immediately—bigfoot, sasquatch, the abominable snowman. We thought of the furry but kindhearted beast in the old Rudolph television show, but scarier, much scarier. Just weeks earlier, one of the two sisters and I had made long moaning noises, throaty groans, outside the youngest sister’s window. We got in a lot of trouble. It was Halloween times and we lacked costumes, but we began what turned into a lifelong obsession with Bigfoot. We weren’t the only ones—for years, people have been impersonating Bigfoot by sporting both good and subpar Halloween costumes. Below are a few of their stories. In 2008, a Georgia Sheriff’s Deputy and his friend acquired a Bigfoot Halloween costume they thought would take them all the way. Claiming to have discovered a body, the pair went live with photos and Youtube videos (since taken down, but excerpted here [https://www.youtube.com/user/bigfootpolice]). Photos revealed a decomposing sasquatch shoved into a cooler, complete with underbite dentures. In 2012, a Montana man dressed not in a Halloween costume, but a military Ghillie suit and set to trick drivers on a highway. Unfortunately, it was dark and his suit camouflaged him so well that he was hit by a car. 44-year-old Randy Lee Tenley was struck by a second car and died at the scene. 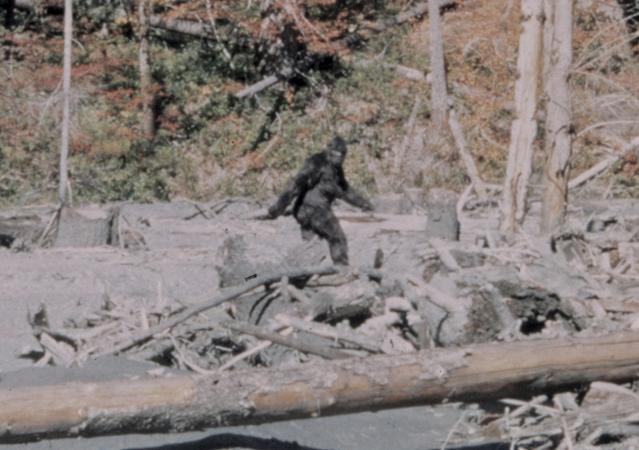 This bigfoot sighting is not necessarily a hoax—unlike the others, there is no definitive proof. The Patterson-Gimlin film is considered the most credible (and first) of all bigfoot evidence and depicts what is assumed to be a female sasquatch sauntering across a meadow in California. Recently, Bob Heironimus has come forward, claiming that Robert Patterson paid for a suit and Heirononimus, eager to make a quick buck, played a lady bigfoot.